"Driving to town from home should be less than 10 minutes, but we take 30 minutes because the road is very bad,” says resident Lonwabo Gagela. 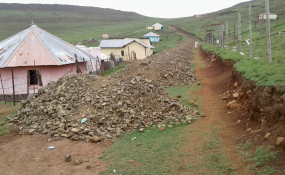 Fix our gravel roads or we won't vote, a resident of Magwala village told Mayor Jongumzi Cengani of Intsika Yethu Local Municipality, Eastern Cape, at a public meeting last week. Magwala villagers say their roads have not been fixed for 19 years. To add to their frustration, the stones and gravel to fix the roads of the surrounding villages are excavated from their village. Magwala is near Cofimvaba town and it has three main gravel roads. The community were demanding answers from the Mayor, Municipal Speaker Khanyisa Mdleleni and ward 15 councillor Albertinah Rotyi. The meeting, held in Mcungco village, went on for almost eight hours. "I was part of the people who stopped the [municipal] trucks [taking gravel away], and told the drivers that every day they must first drop six loads of stones at our village before they can do their daily duty," said Gagela. "I'm sure you all saw the stones left on the road when you came here, and we asked the municipality to bring a machine to level the gravel road, and we were told to do it ourselves." A resident who identified himself only as Xolile said, "What we want now is these roads to be fixed before May. And we are not playing - we are going to close all the voting stations because these schools [used as voting stations] are ours and we will close them if we want," said Xolile. Mayor Cengani asked community members to be patient, but community members said no officials would leave until a timeframe was given to fix the road. After spending almost 30 minutes on the phone, Cengani returned to the meeting and said, "Honestly there is no budget to fix these roads, but there is an intervention grant that we can use to fix the roads in the meantime." He asked for the work to start on 2 April, instead of next Monday, which the community had demanded.